Did you know that many fresh herbs can be frozen in the summer when they’re abundant and then used all through the winter? This post shares tips on how I freeze rosemary and thyme from my garden. Click here to PIN this useful post so you can find it later. Even though it’s still quite warm in Utah, I can feel the nights getting a bit cooler, and I know it’s not that long until the garden goodness has to either be preserved or lost. I hate losing anything that comes from my garden, and try to freeze as much as possible. Since I have lots and lots of herbs, a few years ago I started to experiment with freezing them to see if I could preserve the flavor enough to make it worthwhile to use the herbs in the winter. I’m no expert, but I’ve learned a few tricks. If you’re going to try freezing herbs, first it helps to understand the difference between soft herbs and hard herbs. A while ago Helen from Beyond Salmon wrote an excellent post on preserving and using herbs in which she explained this quite well. Basically soft herbs are things like basil, cilantro, parsley, oregano, and mint which are either eaten raw or added only for a few minutes of cooking. I’ve written earlier about how to freeze fresh basil, and I suspect that many of the other soft herbs can be frozen that way also, although basil combines especially well with the olive oil. 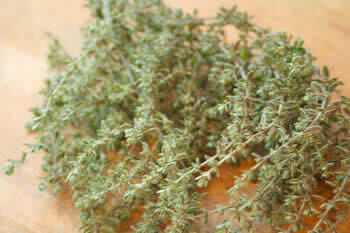 Hard herbs are things like rosemary, thyme, savory, and sage which are suitable for long cooking times. The two things from this list that I’ve had great luck freezing are rosemary and thyme. I actually discovered how to do this somewhat by accident when I cut the branches off my rosemary and thyme bushes one fall and didn’t have time to pick the leaves off. I washed the herbs, then put the stems into a Ziploc bag and put it in the freezer, not sure what would happen. I was delightfully surprised when the frozen leaves fell off the stems, and even happier when I tried using some of the frozen rosemary and thyme leaves and discovered they were nearly as good as fresh. Try this if you have rosemary and thyme in your garden and live where there’s a cold winter, and I think you’ll like the result. Cut some thyme branches. Herbs should be washed in cold water and either spun dry or blotted dry with paper towels. 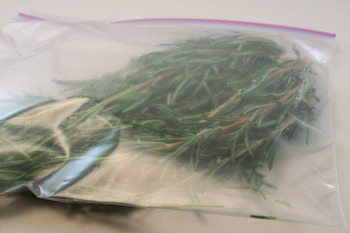 Put rosemary in small Ziploc bag. Use a separate Ziploc bag for the thyme. 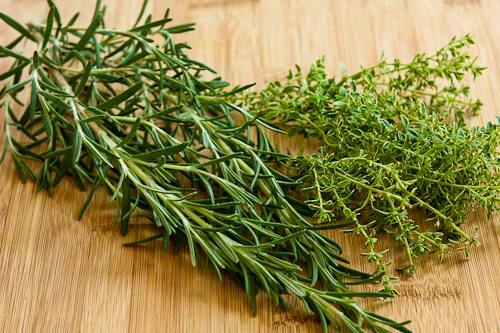 Let thyme and rosemary stay in the freezer for several weeks. 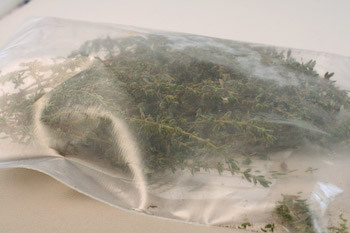 After a few weeks, take ziploc bag out of the freezer and use a rolling pin to roll over the bag containing the herbs. You should see a significant amount of leaves come loose from the stems. If some leaves don’t come off, you can remove the loose leaves and freeze the others a bit longer, or pick the rest off by hand. This rosemary has been frozen for nearly a year and is still green and very fragrant. Thyme is a bit more fragile than rosemary, but this thyme is still great after nearly a year in the freezer. That’s how easy it is to preserve the rosemary and thyme from your garden to use in wonderful soups and stews all winter long. 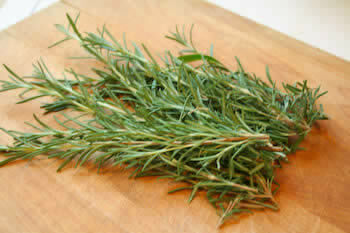 Use the frozen leaves in any recipe calling for fresh rosemary or thyme. 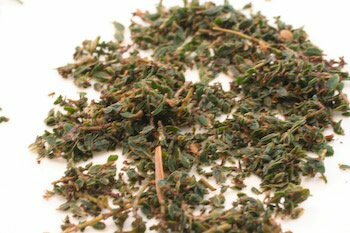 For recipes created using dried thyme or rosemary, use about twice as much of the frozen herbs as you would the dried version. 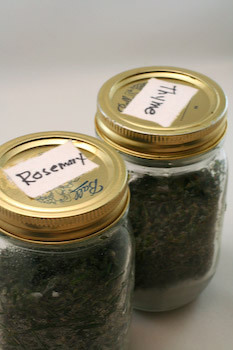 How well do you think that the rosemary and thyme will do if I put them in my sealable foodsaver bags? Or do you think it will crush the herbs too much as it is sucking out the air? I might let them freeze inside the open bag, then seal when they’re frozen. But I think it’s a great idea! They should be pretty dry when you put them in the freezer, but they don't need to be 100% bone dry. Just so I'm clear, when you rinse the herbs then they're still kind of damp when you put them in the freezer, right? You're just blotting them and not actually letting them set out on the counter to 100% dry before putting them in the bags and freezing? Thanks for the info on freezing herbs. Katy, so glad it was useful for you. I still do this every year! This is an oldie but goodie. My friend Googleed me up your site. I had a ton of rosemary and nothing to immediately use it in so I needed help. Thanks for this! I haven't tried freezing chives. Let me know how it works if you try it! I have tried freezing rosemary just like you did – kind of lazy and just threw them in a bag in the freezer! I love that you put your herbs in glass jars! 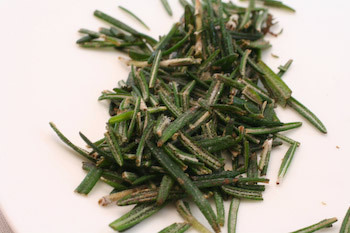 Have you tried freezing chives? Cindy, did you try entering your e-mail after you click the link that says "subscribe by e-mail" and it didn't work? If so send me an e-mail (under Contact) and I will forward it to the company that manages the e-mail subscriptions. Great post! I've pinned it and shared it on Facebook, but I can't seem to successfully subscribe to your blog via e-mail. 🙁 And I WANT to!